But when her wedding takes a fatal turn, Maya becomes the queen of Akaran and wife of Amar. Yet neither roles are what she expected. As Akaran's queen, she finds her voice and power. As Amar's wife, she finds friendship and warmth. A top ten finalist in the 2017 Locus Awards in the First Novel category. “Chokshi’s rich, descriptive writing weaves a lush web. A swoony romance, betrayal, and a journey to power and self-affirmation, with a slightly wicked, slightly funny animal sidekick in the best tradition work together to create a spell that many readers will willingly succumb to. Richly imagined, deeply mythic, filled with lovely language with violet overtones: this is an author to watch." “[An] exquisite debut novel…Chokshi’s prose is captivating, and the pages come alive through lush descrptions of Night Bazaar teeming with Otherwordly delights, gardens made of glass, and realsm where the lines between life and death are blurred. Maya is a strong heroine, and while there is romance, an emphasis on familial love adds another level of richness to a folkloric fantasy about sacrifice, self-discovery, and making your own destiny." “Chokshi’s first novel is filled to the brim with gorgeous, scintillating writing that easily draws readers into its new take on traditional tales. A unique fantasy that is epic myth and beautiful fairy tale combined." "Magic is woven into every word of the The Star-Touched Queen Vibrantly imaginative and gracefully written, I was spellbound from the first line. A dazzling, sensuous feast of world-building, romance, and mythology." —Sarah J. Maas, New York Times Bestselling author of the Throne of Glass series. 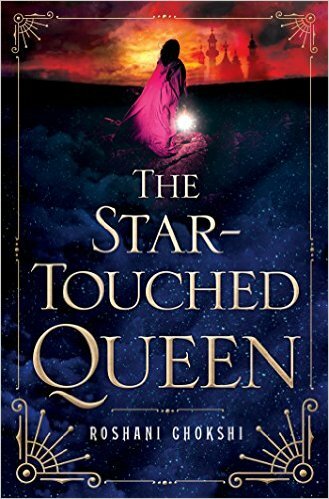 "The Star-Touched Queen enthralls with mystery and romance. Chokshi's storytelling glimmers like magic on every page-a novel meant to be savored." "The Star-Touched Queen is a luscious, bloodthirsty fairy tale with all the romance, magic, and gorgeous mythology I could ask for, plus the greatest flesh-eating, talking demon horse I never knew I wanted." "Gorgeously poetic writing gives vibrant, sensuous life to the worlds of The Star-Touched Queen. Chokshi never shies away from forcing her characters to make hard choices, and I was captivated by Princess Mayavati's cleverness and determination as she struggles against fate and betrayal." "A richly detailed world and a story filled with twists and turns, The Star-Touched Queen had me breathless right up until the final, stunning conclusion. Roshani Chokshi has crafted a bewitching tale with a setting so vivid and unique, I wished I could step right through the pages." —Amy Ewing, New York Times Bestselling Author of The Jewel.